Is it Tuesday already?! Where is the world did Monday go? AND it's the 1st day of August - woah! 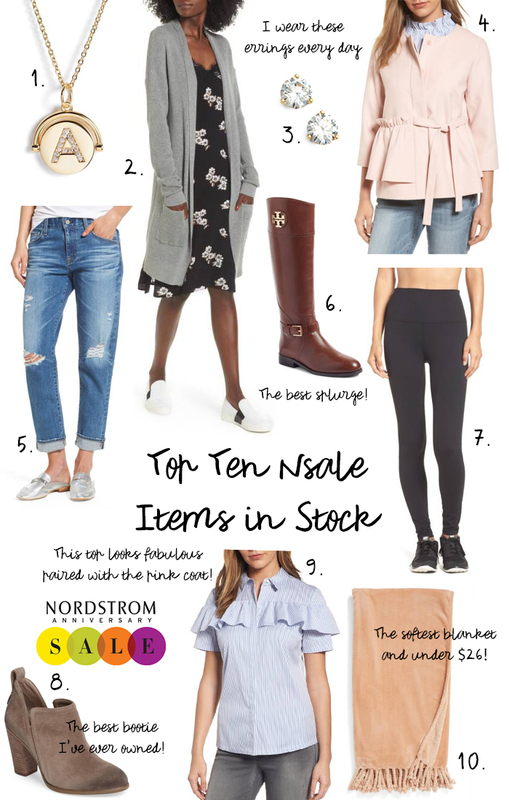 This means there are only six days left in the Nordstrom Anniversary Sale, and believe it or not, there are still lots of good items to be had. I rounded up ten of my favorites that are still in stock, many of which are staples for the coming fall season. And if you wanted something out of stock make sure to keep checking because items are flying in and out of the sale! I've been sharing lots of restocks on pardonmuahinsta on Instagram so make sure to check back often. 1. Initial Necklace // Although it's small, this necklace is one of my favorite purchases of the Nordstrom Anniversary Sale. It's dainty and classic, and pairs well with other necklaces I already own. I even bought one as a gift for my mom's birthday and it was a huge hit! 2. BP. Rib Stitch Cardigan (size down) // This ever popular cardigan flew off the shelves the first two days of the early access sale. Luckily, it keeps getting restocked in various colors and sizes. It's nice and lightweight making it perfect for a summer to fall transition. And because of its length, it also looks great with dresses. 3. Diamond Cubic Zirconia Earrings // I own two pairs of these earrings and love them. I wear them every single day and rarely take them off, except to replace them with the occasional colorful tassel. They come in various sizes and you have your choice of gold or silver. 4. Halogen Soft Ruffle Jacket (size down) // This was the first must-have item I picked out of the Nordstrom Sale catalog and surprisingly, it was even better in person when I pulled it out of the box. It's a very soft material and is going to pair well with simple shirts and light sweaters. It goes great with the favorite #9. You can see the jacket on in my recent post HERE. 5. AG Ex-Boyfriend Crop Slim Jeans (size down) // This is an item I've been trying to snag the entire sale. I saw them on another blogger and she looked so amazing in them I knew I needed them in my life. At the moment, I don't own a boyfriend jean and these are perfect because they aren't too baggy. If anyone sees a size 23 come into stock, let me know! 6. Tory Burch Adeline Boots (narrow feet = true to size, normal = size up) // I never expected to buy these boots, especially since they are such a splurge. But then I talked to several ladies who said they've had theirs for years and that they are just as comfortable and look just as good. Which to me is really a testament to the quality of the product. So I took the plunge and boy are they comfy! You can see them on in my recent post HERE. 7. Zella Leggings (size down) // I will be wearing these leggings with my Tory Burch boots all fall and winter. I own three pairs of Zella leggings in black and they are perfect for boot wearing season because they are a thicker material that keeps you both warm and concealed. I don't even wear mine to work out because I want them to stay in good condition for as long as possible. 8. Vince Camuto Bootie (true to size) // I can't say enough good things about these booties. Because they are cut low on the ankle I don't wear socks with them and they still fit like a glove and are so comfortable! I've been wearing them to take outfit photos lately and love them more and more and more. You can see them styled in my post HERE. 9. Halogen Ruffle Front Poplin Shirt (size down) // I'm shocked this shirt is available in almost every size! I didn't expect to like it as much as I do but it looks awesome with a high waisted skirt or with the pink jacket from favorite #4. I decided to keep it because I feel like it's versatile while still having a little pizzazz. A great top for work! You can see this shirt on in my recent post HERE. 10. Kennebunk Home Blanket // Can you say oh. so. soft?! I liked the first one of these I purchased (in white) so much that I had to order another (in pink peony). We are really rough on blankets in our house so we were due for a nice new set. I'm keeping the pink in my office/vanity room and the white in our living room. FYI the white is more of a cream.